Sawing someone's head off with a chainsaw-gun: OK! Abducting someone's son: that's a no-go. 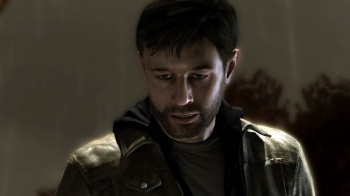 Heavy Rain, a dramatic noir thriller revolving around the abduction of main character Ethan's son Shaun, went on to become one of the PlayStation 3's strongest games, receiving universal praise from critics and becoming a bestseller for the system. But, it was almost an Xbox 360 title, Quantic Dream's head of development David Cage, revealing that the developer first pitched the game to Microsoft, who rejected it due to the aforementioned child abduction plot. "We were pitching Heavy Rain to different publishers, including Sony, and we went to Microsoft," said Cage at this year's BAFTA annual games lecture. "They got scared by the fact that Heavy Rain was about kids being kidnapped, and they said, 'This is an issue, we want to change it'. Well, we could have kidnapped cats, it would be a different experience!" "For me, that was a very interesting signal. It was like, you know what, I don't think we can work together, because you don't understand what I'm to achieve here." he continued, "They were scared of the scandal and scared of what people may write and what people may think. 'Oh, this is a developer and the publisher making games about a child getting kidnapped." Cage said his conversations with Sony went much smoother, with the studio understanding that it had to take a risk to publish a great story. "We had this conversation with Sony very honestly saying, 'Okay, there is a reason here'. But I think they understand the upside of what we were doing. We could understand each other, and this is how Heavy Rain happened."